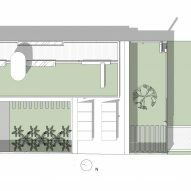 Architecture firm Estúdio 41 has designed this small, white house in Brazil to be highly sustainable, including photovoltaic panels, a green roof and a rainwater collection system. 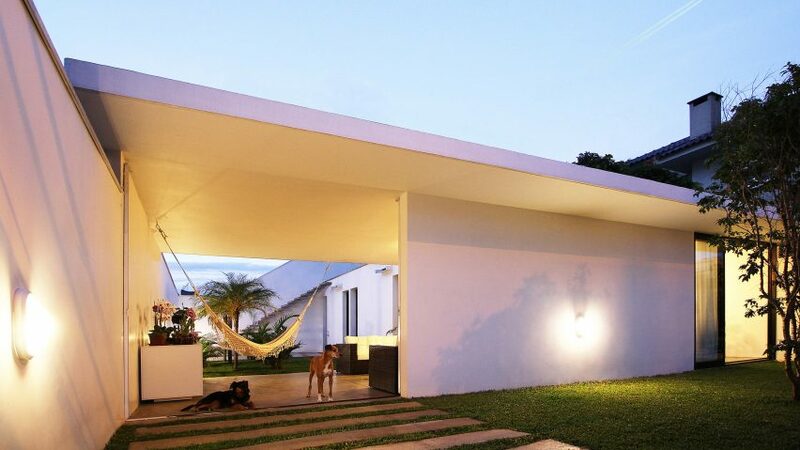 Hauer House is located in Curitiba in southern Brazil. The project is named after its location in the city's Hauer district – a former industrial zone that has transitioned to a residential neighbourhood. The main goal for the project was to create an "economically and environmentally correct building" that would be easy to maintain. Providing ample outdoor space was also important. 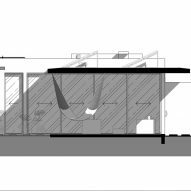 In response, the team conceived a 119-square-metre, single-storey dwelling, which takes up just half of the rectangular property. The remainder of the site is turned over to outdoor areas. 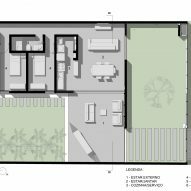 "A house with minimal programme was expected to make the building feasible financially, while also freeing up outside space," said local firm Estúdio 41 in a project description. The low-lying house is L-shaped in plan, with rectilinear bars organised around a courtyard. Situated off the courtyard is a staircase comprising cantilevered, concrete steps, which leads up to a rooftop garden. White-painted walls are made of concrete blocks, which helped keep costs down. The building's foundation – which features piles driven deep into the ground – responds to fragile soil conditions and a shallow water table. A verdant lawn is set to the front of the residence and bisected by a tall fence made of perforated metal panels. The wall has a transparent quality, enabling the home to feel connected to the street and surrounding neighbourhood. The home has large apertures, including retractable glass walls that diminish the boundary between inside and out. In areas that receive direct sunlight, the team used double-glazed windows to help reduce heat gain. 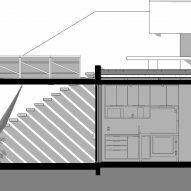 The numerous openings in the dwelling enable fresh air to circulate throughout. "Natural ventilation is guaranteed in all internal spaces, being amplified by the positioning of large openings in the direction of prevailing winds," the studio said. From the very start of the project, sustainability was a guiding concern. In addition to strategies to reduce energy consumption, the home has eight photovoltaic panels, each with a capacity of 270 watts. The solar array, which is tied into the electric grid, can generate more power than the home requires, resulting in credits for the owners. The team also incorporated measures for conserving water. Rainwater is stored in rooftop and underground cisterns – and then channelled to various taps around the property. Moreover, the vegetated landscaped captures stormwater and reduces the amount of rain sent to the public drainage system. The team used building information modelling (BIM) during both the design and construction stages, which allowed for heightened control and precision. "The design process was just like the tailor's craft, where the measurements are precise – nothing in excess or missing," the team said. Creating climate-responsive buildings has become a common practice in Brazil. Other recent projects in the country that prioritise environmental factors include the Box House by FCstudio, which has rooms that fully open to the outdoors, and the IF House by Martins Lucena, which was designed to capture prevailing breezes and minimise solar heat gain. Photography is by Eron Costin.